he lion, the tin man or the scarecrow ... which one are you? Really, no kidding. Think about it for a minute. Are you like the scarecrow, finding ways to avoid taking risks by thinking you're not smart enough or educated enough? Maybe, like the tin man, you've become jaded by life and have shut down your heart to your dream. If you're sneering right now and thinking dreams don't come true, the tin man in you is alive and well. Or are you the lion  scared of the spooks that lurk around every corner? There may be modifications and variations to these descriptions, but over the last few months I've been taking a steady look at some of the common challenges my clients face as they shape their visions and bring them to life. First is what I call the Scarecrow Syndrome. It goes like this: A client comes in excited about starting a business or launching a new life venture. Before they have a chance to fully imagine what they want to do, they say, "I think I need to go back to school" or "I need to get more training." I recently asked a client with a double master's: "Why?" There was a long pause. "Because I don't know enough." Pause. "For what?" I asked. "Well," (very long pause), "there are people who have a lot more knowledge than me." As Dorothy releases him from his self-corrosion, the tin man confides, "I've held this axe up for ages, when about a year ago it rusted in place." After years of doing what we think is expected of us, we can suddenly become estranged from our heart and paralyzed by life. Once emotions return, they can seem overwhelming and unsettling. The tendency can be to get lost in our emotions and feel helpless. It's neither fun nor pretty. And yet, our fears and doubts can be a comfort to swirl within  at times far more tangible than that nebulous idea in the enchanted land of fantasy. And that, dear friends, is where the Lion's Lair can trap us in our fear. It's at times like this that nothing seems more elusive than courage. When every ounce of sensible thinking says, "What the heck are you doing? Who do you think you are, wanting that?" When family and coworkers ask, "Why don't you just get a job?" courage fades and fear takes over. That's when we start fighting life. We think we're doing all the right steps and taking all the right actions. But if we don't couple the courage and wisdom to be true to our vision, the outcome will never be truly fulfilling. What makes these characters so memorable in all their uncertain stumbles and bumbles? Their passion truly did exceed their uncertainty. Their determination was far greater than their fears. They were driven by a vision that was more powerful than any single action. 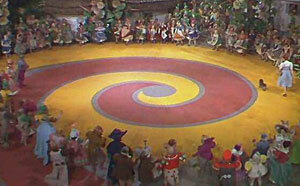 And they took things step by step as they traveled that yellow brick road through all its many haunts. As for me? I'm a lion with a dose of tin man. Read part one of Carolyn's series on creatives. And look for more in coming months. Carolyn Campbell is a life vision and leadership coach in Portland. Read her previous work in our archives, check out her profile in Sketch Pad, visit her Web site, e-mail carolyn@thecoresource.com, or give her a call at 503-493-9497.